IHG® Rewards Club - Juegos - Daedalic Entertainment - Holy Potatoes! We're in Space?! NOTICE: Activation key must be used on a valid Steam account. Requires internet connection. 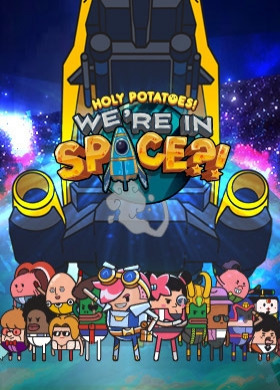 About the game	Holy Potatoes! We're in Space?! is a space adventure game with management elements and turn-based combat. Manage your very own spaceship and explore a procedurally generated universe with dozens of planets to explore for resources, and enemies you can encounter for intergalactic space battles… . Encounter a cornucopia of space races, such as cosmic carrots, zany zucchinis, obnoxious onions, and even space whales! Take part in epic boss battles and save your grandfather, Jiji, who was incarcerated by the evil federation, The Eclipse. Key Features Craft hundreds of weapons for your spaceship Hire engineers to become part of your crew and man your ship Explore dozens of planets and galaxies, or why not explore the whole universe! Gather resources to upgrade your spaceship and craft weapons! Combat evil galactic broccoli and extraterrestrial carrot spaceships, and many others! Encounter epic boss battles! System Requirements Minimum OS: 7 / 8 / 10 / Ubuntu 14.04 LTS / Mac OS X 10.6 Processor: Intel Pentium Dual Core 2,5GHz or AMD Athlon 64 X2 3GHz Memory: 4 GB RAM Graphics: ATI Radeon HD4000 series or nVidia GeForce 9000 series DirectX: Version 9.0c Storage: 3 GB available space Recommended OS: 7 / 8 / 10 / Ubuntu 14.04 LTS / Mac OS X 10.6 Processor: Intel Core2 Duo 2,3GHz or AMD Phenom II X4 3,4GHz Memory: 4 GB RAM Graphics: ATI Radeon HD5000 series or nVidia GeForce 500 GTX series DirectX: Version 9.0c Storage: 3 GB available space © Copyright 2017 Daylight Studios & Daedalic Entertainment GmbH.Daylight Studios, and Holy Potatoes! We're in Space?! and their respective logos are trademarks of Daylight Studios Pte Ltd.Daedalic and the Daedalic logo are trademarks of Daedalic Entertainment GmbH.